In large skillet, heat olive oil over med-high heat. Add mushrooms and onions. Saute until mushroom liquid has evaporated, about 5 minutes. Divide salsa over each Flatout. 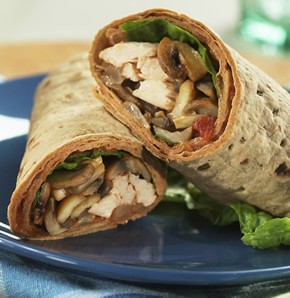 Layer chicken, mushrooms and onions at one rounded end of Flatout. Roll, cut and enjoy! 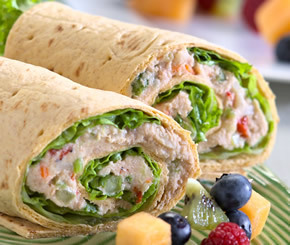 On one rounded end of Flatout, layer the tuna salad, carrots, peppers and Romaine. Roll, cut and enjoy! Spread dressing over entire Flatout. 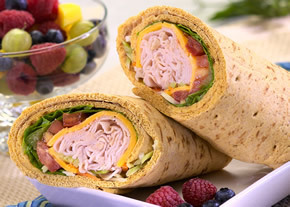 On one rounded end, layer the turkey, cheese, tomatoes and Romaine. Roll, cut and enjoy! On a cutting board, place the watermelon on its side and cut off 1/4"-1/2" from the stem end being careful not to cut to deep into the white part of the rind. This will provide a sturdy base. 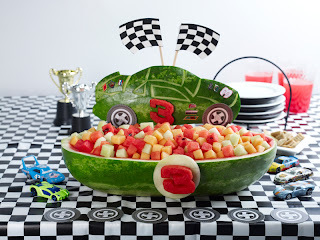 With the dry-erase marker, draw a scalloped line around the width of the middle of the watermelon. 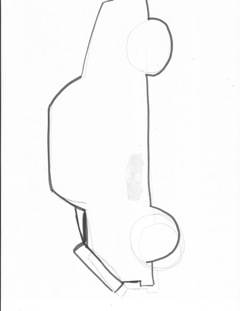 Use a paring knife to cut along the marker line then separate the two halves. Use the melon baller to scoop out the watermelon that will be your base. Cut the top half of the watermelon in half and use the dry erase marker to draw a large set of lips on one half. Use a paring knife to cut out the lips. Once you have the general shape, carefully carve away the rind. Use the paring knife to shape the lips into a more finished look. Cut the remaining 1/4 in thick slices and cut hearts, X's, O's or other shapes, discarding the rind. Attach the lips to the top of the base using wooden skewers and toothpicks. Slice the strawberries lengthwise into 1/4" slices, keeping the strawberry tops on for decoration, if desired. Attach a slice of strawberry with the green top to the center of each scallop using a toothpick. Use the rest of the strawberry slices in the fruit salad for the fruit bowl. 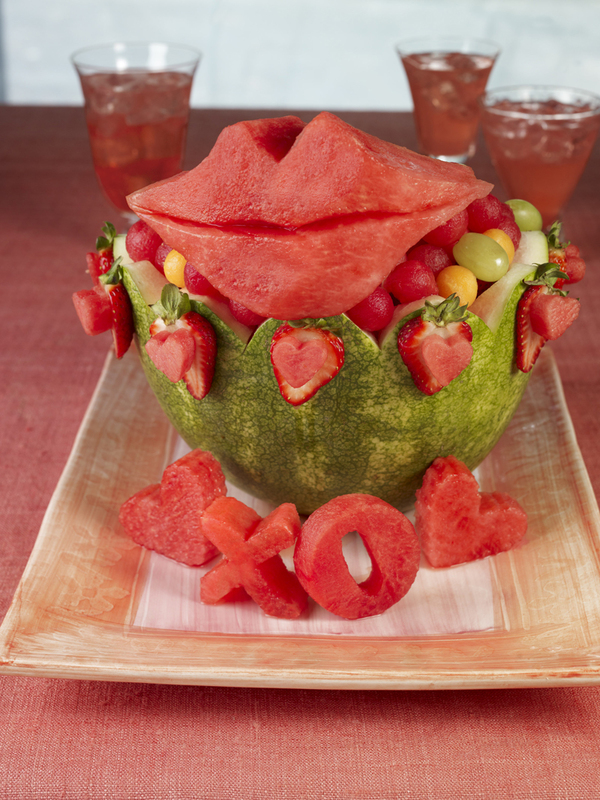 Place the fruit bowl on a serving platter, fill with fruit salad & garnish with slices of fruit cut into hearts, X's & O's, if desired. On a cutting board, place the watermelon on its side and cut off 1/4”-1/2” from the yellow under side to provide a sturdy base. Roll 1/4 turn to allow you to cut the watermelon in half lengthwise, so you have one half with the sturdy bottom and the top to use for watermelon cubes. Use the large ice cream scoop to scoop out a large red ball to create the red bird from the center. 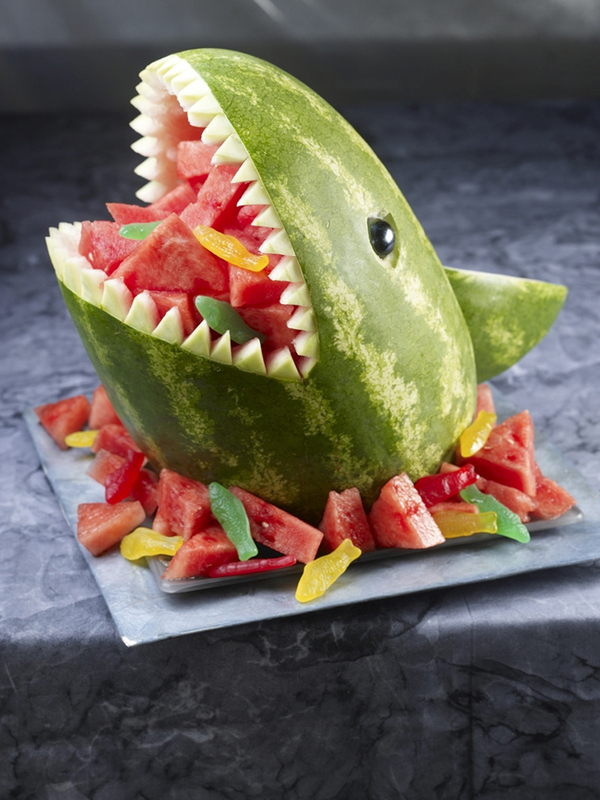 Hollow out the top half of the watermelon with a spoon or scoop, reserving the watermelon pieces to dice up for blocks for decorating. Cut a rectangle out of the base section, leaving a flat surface on each side of the middle. Reserve a small piece of the outer green top half for the pig noses. Cut the yellow watermelon in half and use the large ice cream scoop to scoop out a large yellow ball to create the yellow bird. Cut a small section off each side of the yellow watermelon ball to make it appear more triangular. Use the rest of the yellow watermelon to cut up for diced watermelon around your carving. 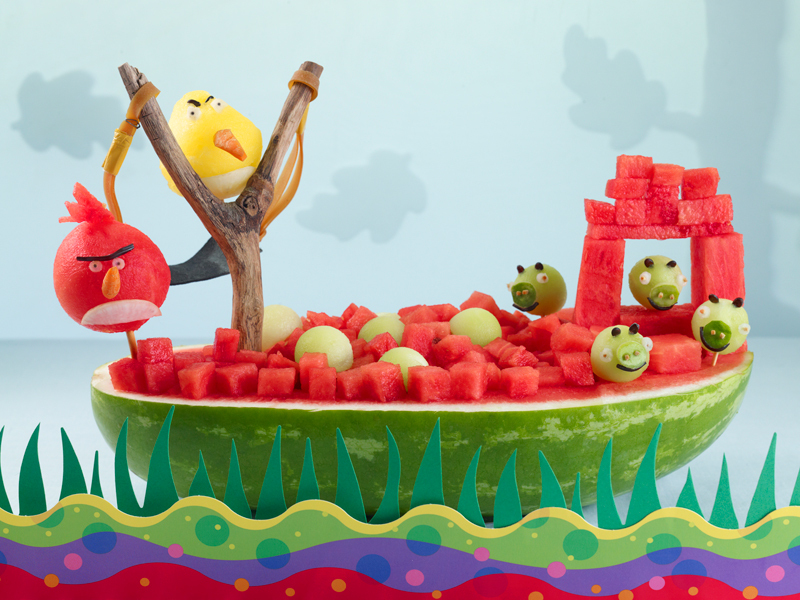 Cut the honeydew in half and create 8-12 melon balls using the melon baller for the Pigs. Dice or use the melon baller for rest of the fruit to serve around your carving. Use thin slices of the Daikon radish to make the white belly & eyes for the two birds, cheeks for the pigs. Use the green watermelon rind for the pigs’ noses & watermelon seeds for the eyes for the pigs. Trim licorice for the pig smiles. Attach everything with toothpicks (cut or snapped in half). Use the carrot tip for the birds slanted beaks. Attach the slingshot to one end of the base of the watermelon and secure one of the large Birds with a pencil-sized dowel so it appears it is being launched out of the slingshot. Secure the other bird next to the slingshot. On the other side of the base secure the pigs on watermelon cubes that resemble the stacked up blocks. Fill the center with ready to eat cut melon and warn guests not to eat the decorations. ***Warning, the decorations on this are not to be eaten, they contain toothpicks. On a cutting board, place the watermelon on its side and cut off 1/4”-1/2” from the stem end, being careful not to cut too deep into the white part of the rind. This will provide a sturdy base. Using the paring knife, cut a 3-4” round circle in the top of the watermelon. 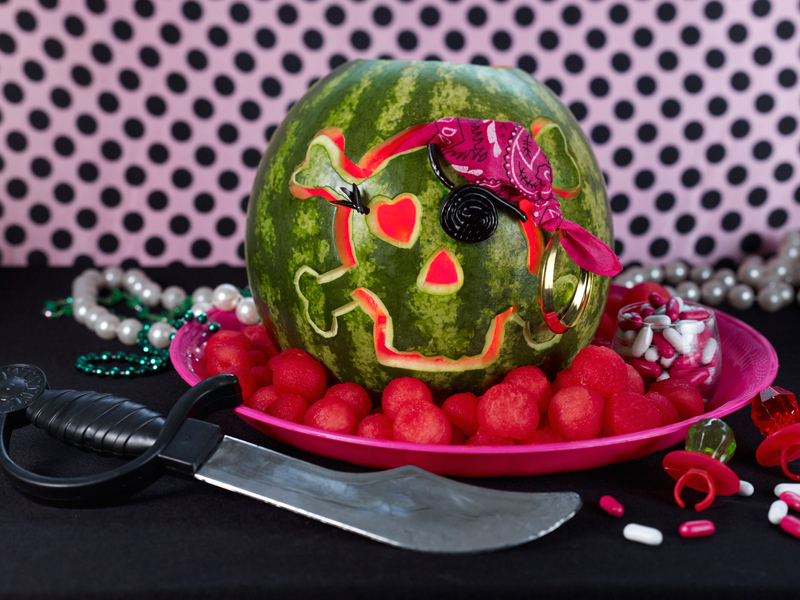 Hollow out the watermelon with a spoon or scoop, reserving the watermelon pieces to make your melon balls to use around your watermelon carving. 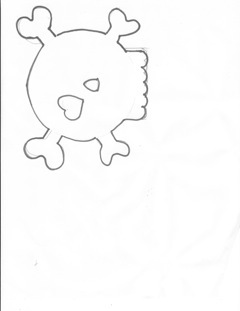 Outline the skull template using the dry erase marker. Use the channel knife to trim away the outline of the skull you made with the template. 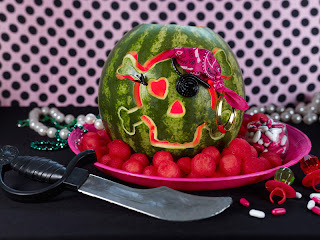 Once the outline is made, use a paring knife to trim away 1/4”- 1/3” space next to your outline, being carful to leave a few places, like the lower bones attached to the watermelon so the entire skull does not come completely away from the carving. 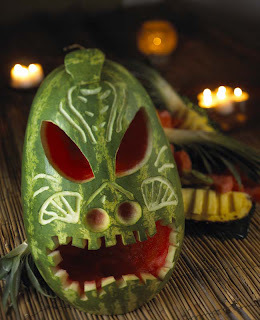 (*If you do cut all the way around, use toothpicks to secure the skull back to the watermelon in several places). Carefully use the cut all knife to trim away extra green skin so that there is white trim showing all the way around your skull so it is more defined. Decorate with a black licorice disk attached with a toothpick or straight pin, tuck in a piece from a bandana or a hoop earring and add flameless candles to light up your carving. Place on a tray and add watermelon balls to serve. Choose an oblong seedless watermelon for carving. Wash watermelon and pat dry. Hollow out both sides, using a melon baller. Carve out block design in the bottom side, using a channel knife. (Copy from photo). Use a dry erase marker to trace turtle shell, legs, and head on top side of watermelon. Carve shapes with knife, and add designs with channel knife. Add peppercorns to the eye holes to fill. Fill bottom with fruit salad. 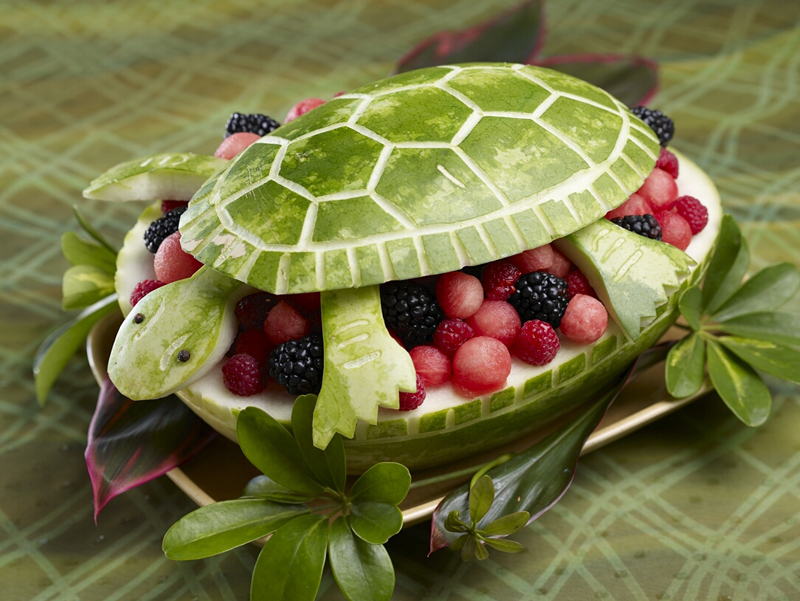 Attach legs and head to shell, using strong toothpicks or skewers, and put on top of salad. Add accents around base with leaves and plants. 1. Boil sweet potatoes till tender add honey, buttermik, butter,cinnamon, salt and pepper to taste. 4. Saute in oil the onions, garlic, and turkey till just under done. 5. Add curry, salt, pepper, sage, sprinkle flour over turkey mix and pour in the milk. 7. In a butter 8x8 casserole pan lay meat mixture then place potatoes over meat covering all to seal. 8. Top with dabs of butter. 9. Bake in a 350 degree oven for 15-20 minutes just to slightly brown top. 7 Cook in 400 degree oven until bubbling and brown (about 30 minutes). Broil for last few minutes if necessary to brown. Serves four.